During Ignite 2018 a lot was announced, in the previous post I even called it the big change. One of the biggest things that’s coming soon is called Project Roadmaps. And in this post I would like to shed some light on what the new feature is and what we can expect from it. Because the service isn’t available yet I needed to take images from the official announcement blog from Microsoft. I didn’t create any of them and I would highly recommend you read the original article. PS: Howard, I love the Star Wars themed project names :). Roadmap is a visually exciting way to combine information from multiple Waterfall and Agile projects and share it with co-workers. What I take away from this is that there are multiple names we are giving the service: Project Roadmaps is probably the official term, but we can also call it Roadmap. For me, Project Roadmaps is a way to visualize the organizations projects and Agile endeavors that reside/originate across different business applications. It is an solution to lets “teams work the way they want and provide managers/executives with the results they need”. And yes that’s another quote from the new Microsoft vision on how they want to support Project and Portfolio Management. We also know that it is a modern solution. Meaning that it will run on the Common Data Service (CDS) for Apps. Which is great! Because the promise of CDS for Apps is that it’s very easy to integrate with. It will be used by a wide range of Microsoft solutions. Linking Roadmaps to applications in the Microsoft ecosystem should be really easy (if not already available out of the box). Where will we find Project Roadmaps? Once Roadmap is released it will start showing up on the Project Home screen (here’s my first impression on Project Home). Project Home is another feature that was recently released. 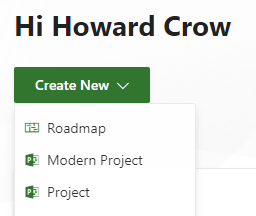 Roadmap shows up under the create button as a new option next to creating a new Project or a Modern Project. It isn’t made clear from the screenshots I’ve seen so far what the URL extention will be. Project Home can be reached through https://Project.microsoft.com so it would be cool if we stick with the name convention and get something like Roadmap.microsoft.com or Project.microsoft.com/roadmap but I’ll keep you updated as more information is provided by Microsoft. Once you created a Roadmap it will show up in your list of recent items on Project Home. And it will respond the same way all the other recent items respond currently: It’s giving you some basic information, as well as the option to favorite the item on the recent list to make it stand out in the top section for Project Home. From the above image it’s also clear that there will not be a single Roadmap for the organization. I believe that the Project Roadmaps feature is designed to give program managers a overview of their programs regardless of the tools the underlying Project Managers use Project Online or a Agile solution such as Azure Boards. That brings me to the first use cases, what would we use Roadmap for when it first hits the Office365 tenants that we operate on? 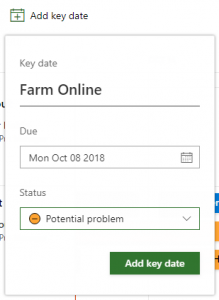 During the Ignite 2018 announcement it was presented that Project Roadmaps will have the option to include any project created within Project Online or Azure Boards (formally known as VSTS). Be aware that this is linked to a tenant. So if you have a Test, Acceptance and Production tenant this will not grab Projects between these separate entities. But if you have multiple PWA’s on your Production tenant you will be able to link to them individually. Let’s imagine a program manager working in an organization that leverages Project Online for traditional Waterfall projects and uses Azure Boards for the Azure endeavors. This person will now have a solution to gather each sub project from both systems and place them on a canvas that includes a row for each sub project. 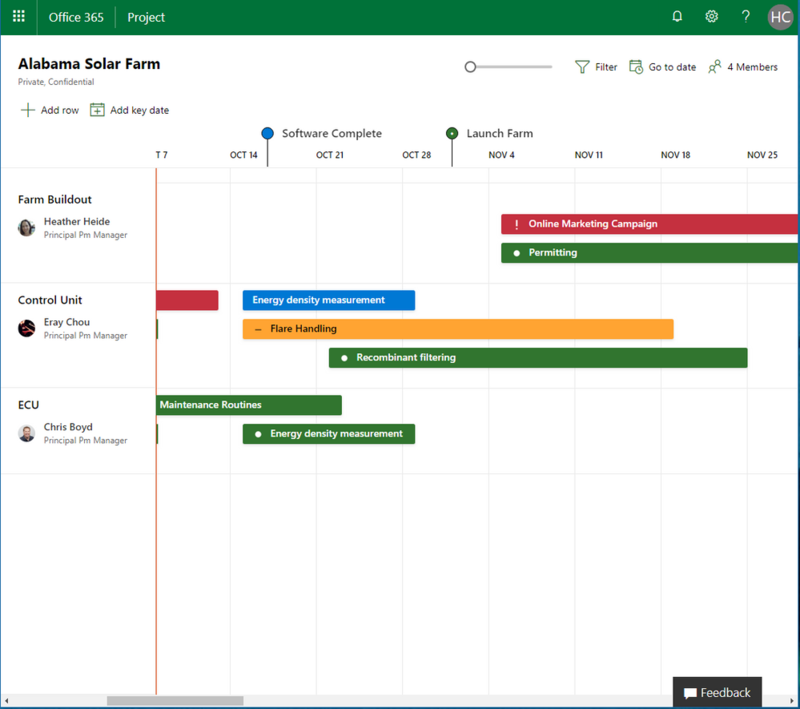 On a row you will have the option to surface important tasks just like you would promote a task to the timeline view in Microsoft Project. Apart from the task items the program manager will manually provide a name for the row and owner. This can be / is different from the project name and owner that comes from the back end systems. With this the program manager can give the row a more suitable name for him to manage and maybe add his key financial stakeholder as a owner for that project. I’m not saying we should. I’m saying we can. One of the features we haven’t spoken about yet is the option to include Key dates. These are similar to milestones in Project Online but span across projects. An example is a launch date or maybe a shipment deadline. A key date can be added to the Roadmap by using the Add key date button. 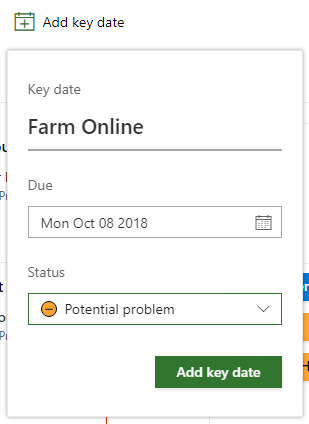 This gives you a menu that includes a name, due date and status. The status has the same color/content as that of the items on the rows. And the date is added on a day level, so no option to include a timestamp such as 08:00. Remember that we are program managers now, details such as time of day is something for project managers to deal with. Once we have our Roadmap the way we want, we can start adding people to the canvas. We do this by adding them using the experience we are used to when adding team members in Microsoft Planner. 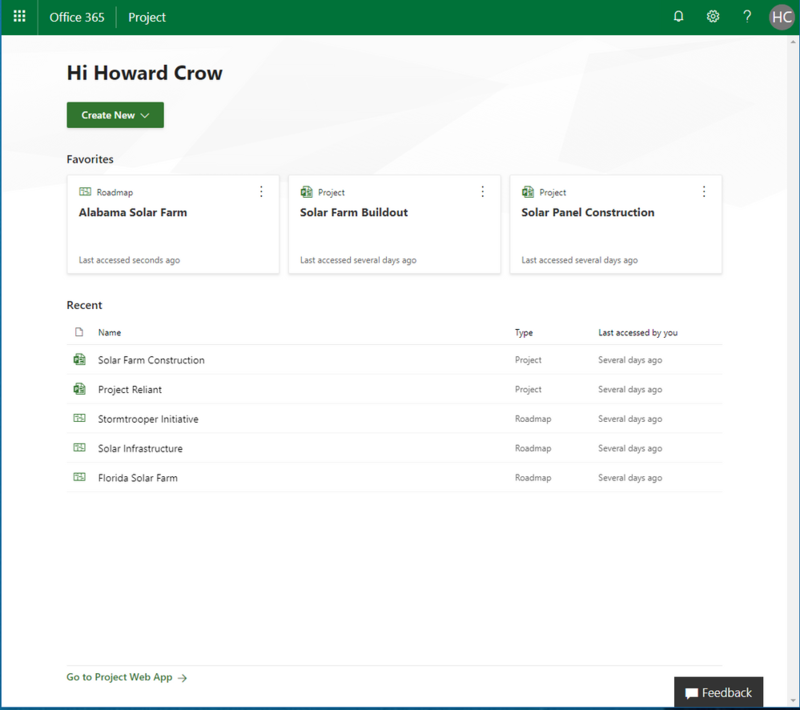 The Project Roadmaps solution leverages the Office 365 Groups functionality. So it should be a familiar interface for people working with applications such as Microsoft Teams, Planner, SharePoint and others. In one of the screenshots that was shared it is clear to see that there is also an option to choose an existing group! Which is awesome because you will have the option to present the Roadmap to your existing Microsoft Teams team without the need to create additional groups. The Project Roadmaps solution is a modern Microsoft solution. This means that it will be based on the CDS for Apps infrastructure. Which in turn means that it’s easy to link up to applications such as PowerApps, Flow and Power BI. I haven’t seen reports based on the Roadmaps, but if the structure is available in CDS for Apps we will most certainly be able to leverage the data and build on top of it using Power BI. Updates from the individual back end systems, such as Agile Boards, are actually maintained using Flow. And that’s great because we might even be able to extend on the existing flows and include our own business logic. Just think about adding a additional rule where the program manager get’s an email if a task on the critical path moves more than 10 workdays. Or if a Key date is in danger because of certain tasks moving within the Roadmap. And because it’s based on the modern infrastructure it’s probably save to say the solution will be easy to read from any device. And if not we could always build our own PowerApps extensions to surface the data the way we would like it. This first version of Roadmap will probably be limited in it’s use. The above mentioned use case is the first one that comes to my mind, but there are limitations. Updates of total task duration is coming through. But not the progress of these activities. The tools that are hooked up with Roadmap is currently limited to Project Online and Azure Boards. What if your organization also uses Planner for instance? Or Jira? Luckily this solution is build to last! There is already UserVoice interaction and the Product Group has promised us that they will pay close attention to the needs of the users. That means that we will see added functionality in the solution incrementally (agile yeah!). And it means that we can help shape the solution. So please have a look at what’s currently being requested in UserVoice, such as the Jira integration. If you liked this article so far you might also enjoy these articles about the feature. The announcement blog and make sure to also read the comments! Peter K’s post also contains a general overview on Project Home, Roadmap and the New Project Service. As well as additional useful links. And Projectum did a webinar about the insights from Ignite which include some insight on Project Roadmaps. But also contains information about other announcements at Ignite. The webinar recording is available on demand. On 14 November 2018 I will do a webinar via MPUG about the Innovative PPM world. 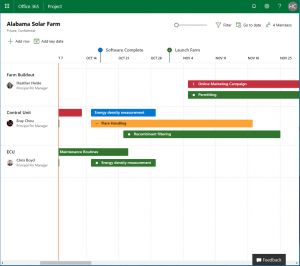 In which I will zoom in on the changes Microsoft is making to Project Management in general. I hope you liked reading about the feature that’s coming soon. In my opinion Project Roadmaps has a lot of potential to become a favorite tool for program managers. And if you agree / disagree please let me know, comments will be open for 1 month. And if you like to receive updates from me you can consider subscribing to my newsletter, already 200+ people have opted in to receive it. It’s a bi-monthly mail that includes references of interest as well as a link to a private file share in which I store content that’s available to you for free (such as a custom UI for the Project Ribbon). And just before you click away, I’ve done a feature release video on Project Home the day it came online. I will do the same for Project Roadmaps, so make sure you subscribed to my YouTube channel as well. Previous Previous post: Ignite 2018, the big change!